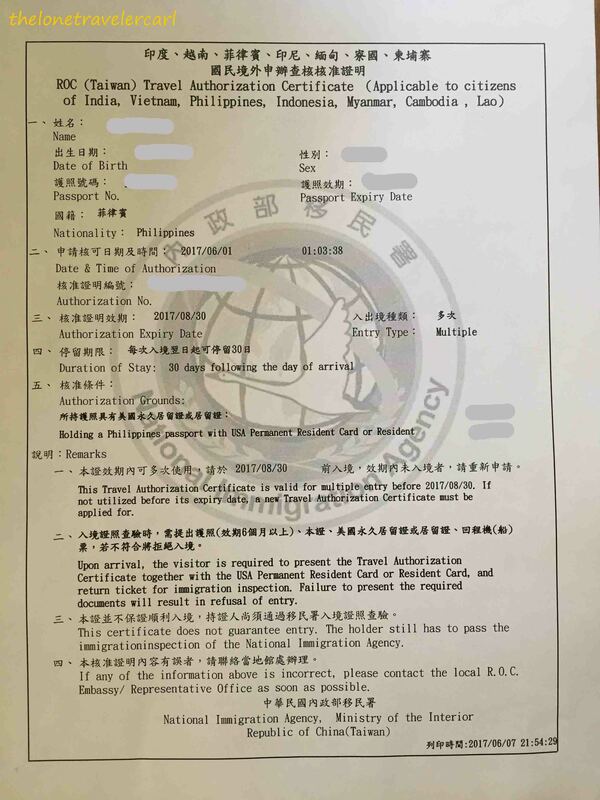 Travel Authorization Certificate is issued to citizens of India, the Philippines, VietNam, Indonesia, Myanmar, Cambodia and Laos to enter the country of Taiwan or Republic of China. Travel Authorization Certificate serves as visa to gain entry to the said country. The residents of the Philippines have been given the freedom to apply for travel authorization certificate thru online or eVisa. It has been amended a lot of times. Before it used to be single entry visa but nationals of the countries mentioned on the certificate seen above can have multiple entry. Additional requirements are applicants must possess at least one of the following documents issued by Australia, Canada, Japan, Korea, New Zealand, any of the Schengen countries, the United Kingdom, or the United States such as valid resident or permanent resident card or status, valid entry visa, or resident card or visa that has expired less than 10 years prior to the arrival date in Taiwan, and the applicant possesses an entry visa or resident card issued by Taiwan at any point in the past 10 years and has no record of immigration irregularities or law violations in Taiwan. The travel authorization certification is valid for 90 days making multiple entries allowed within those number of days. The holder of the certificate can stay in the country for 30 days starting from the arrival day. For online application of ROC travel authorization certificate, click this site here. I got my travel authorization certificate in a jiffy. It took me about few minutes with my information at hand. I made sure to have my passport and permanent resident card ready. After I filled out the form and submitted it online, I automatically got the visa right at that moment. It was convenient and easy breezy. Now, it’s time for me to fly and discover Taiwan.